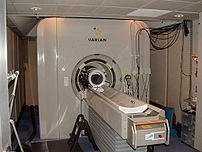 Image via Wikipedia Among complex biological datasets, human genomic and functional imaging of the brain are right up there with the most fearsome wild & hairy beasts. Initial attempts to begin to tame the pair of these beasts by cross-relating the two forms of data have employed highly focused, hypothesis-testing strategies – for good reason – any exploratory association study would require a prohibitively large subject population. Liu and colleagues, in their paper, “Combining fMRI and SNP data to investigate connections between brain function and genetics using parallel ICA” (DOI) provide a new statistical approach to parsing out meaningful neuroanatomical and genetic components from such complex datasets. The authors record brain activity data while subjects attempt to pick out auditory oddball sounds (beep-beep-beep-beep-beep-boop-beep-beep-). As reported, an analysis of the MRI data and a SNP array consisting of 384 SNPs from 222 genes revealed 10 SNPs that were associated with specific patterns of brain activity. Several SNPs were identified (rs3087454 and rs1355920 are located in the nicotinic acetylcholine receptor-7 (CHRNA7) subunit, rs7520974 is located in the muscarininc acetylcholine receptor-3 (CHRM3) subunit while rs885834 is located in the choline acetyl transferase (CHAT) gene) that would explain the known role of acetylcholine in parietal lobe function, a brain region commonly activated in auditory oddball perception tasks. The method – far beyond this author’s sophistication – nevertheless, seems to output data that is well supported by other forms of converging evidence.